this was never meant as an annual review, but hey, there was no time at all during summer to write about all the delicious things we made out of our garden, but now there is some. or at least it is easier to take some time for blogging while days are shorter and often are rainy. and it is also a good time for day-dreaming about the next summer and/or asia. 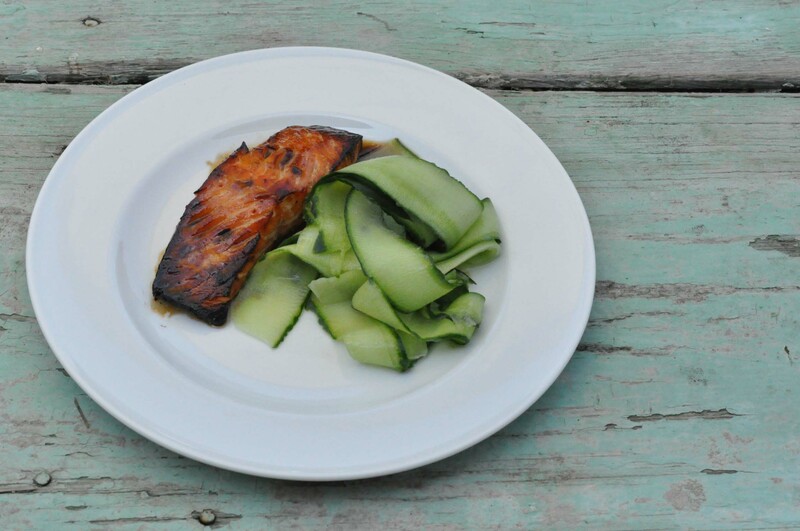 the glazed salmon with cucumber salad fits perfectly for both. the recipe is one of our evergreens which everybody in our family loves, the kids too. so it is an ideal family cooking, also because it is super quick. and by the way also a good choice if you would like to have something fresh and light. the recipe is from one of our favorite asian cookbooks: bill grangers easy asia, so you need some special asian products like mirin and rice vinegar, which you will find at asian groceries or some large supermarkets. the first step is to marinate the salmon for about 15-20 minutes. therefore combine mirin, soy sauce, brown sugar and lemon juice, pour it over the salmon and put it into the fridge to marinate. to prepare the cucumber salad, combine the remaining mirin, rice vinegar and sesame oil. slice the cucumber lengthwise and combine with the prepared dressing. in the meantime preheat the grill of your oven. line an oven proof dish with aluminum foil. place the salmon without the marinade onto the dish. keep the marinate. grill the salmon for about 7 minutes. it should be golden outside and still a bit raw inside. while the salmon is in the oven pour the marinade into a small pan and reduce on high heat until it gets thick. when the salmon is ready, pour the marinade on top of the salmon and serve with the cucumber salad. für die glasur mirin, sojasauce, zucker, und zitronensaft mischen. die lachsfilets hineingeben und 15-20 min im kühlschrank marinieren. für den gurkensalat den restlichen esslöffel mirin, reisessig und sesamöl verrühren. die gurken längs in dünne scheinen schneiden oder hobeln. gurke mit dem dressing vermischen. in der zwischzeit den ofen mit grillfunktion vorheizen. ein backblech oder auflaufform mit alufolie auskleiden. den lachs aus der marinade nehmen und etwa 7 minuten grillen. er sollte außen golden und karamellisiert sein und innen noch nicht ganz durchgegart. die marinade in einen kleinen topf füllen und so lange köcheln bis die konsistenz sirupartig wird. wenn der lachs fertig ist, mit der glasur und dem gurkensalat servieren. This entry was posted in recipes, summer and tagged cucumber by The Cook. Bookmark the permalink.